Founded in 1906, Brewster Ambulance is one of New England's oldest ambulance services. At its peak, Brewster had over 150 vehicles and more than 500 on its team in nine locations servicing major hospitals and communities from Boston to Cape Cod, translating to 75 percent of the Boston market and over 200,000 transports a year. Under the new Brewster family leadership of Mark Brewster and brother George Jr., the Brewster family reputation for quality customer service and excellence in clinical and emergency medical transport service is once again getting attention. 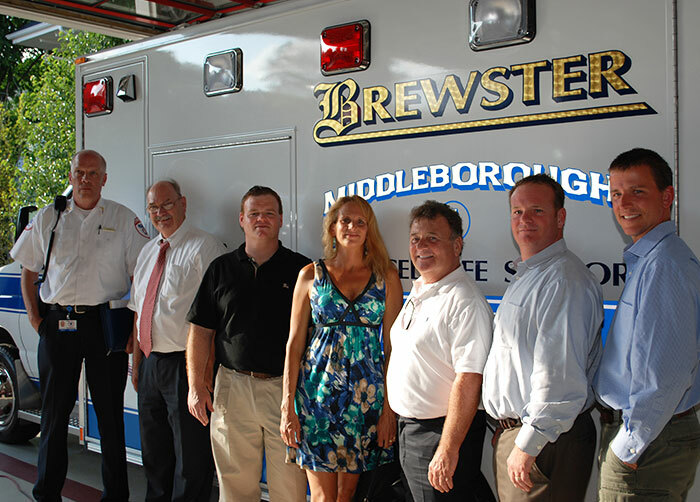 Distinct from other ambulance companies in Massachusetts, Brewster is privately owned and operated. Brewster has no outside investors, is internally funded, financially stable and owns the majority of all company assets. Our leadership creates a sustainable financial strategy so we may continue to be a reliable service provider that builds long-term relationships with the partners, customers and communities we serve. Brewster Ambulance Service Roxbury garage, circa early 1950s. 1996: Brewster Ambulance Service effectively serves 75% of the Boston market with more than 200,000 trips a year in the Commonwealth. Hospitals contracting with Brewster Ambulance Service included Beth Israel Deaconess Medical Center, Brigham and Women’s Hospital, Caritas Carney Hospital, Boston Medical Center and New England Medical Center, among others. 1997: Brewster Ambulance Service announces its acquisition by Medtrans New England Inc., a subsidiary of Laidlaw Inc.
"The Brewster family has proudly served Boston with quality ambulance service since 1906. As President and CEO, I take enormous pride in my family's reputation. I started working for Brewster Ambulance in vehicle maintenance as a mechanic, and later became a chair car driver. After receiving my training and certification, I moved into the role of an EMT where I was able to serve transport patients one-on-one. I then rotated to dispatch and eventually to a field supervisor position. I felt it was important to learn the business from as many capacities as possible and that first-hand experience over the years has helped me understand what our team deals with on a daily basis. I have great respect for every one on the Brewster team and the contributions they make to others. "Not long ago, my brother George Jr. and I recognized a discouraging side effect of the changing medical care landscape: lack of quality customer service in the ambulance industry. That goes against everything our family is about, and we have recommitted ourselves to return quality customer care to the industry with the hope that others will follow suit. "To do this, we went back to the basics and what our family became known for: quality care and customer service. Bigger is not always better. The systemization and commercialization of ambulance service has diminished the importance of real care of real people. People who have apprehension, who have worry about their condition and what’s next. People who need the reassurance of a simple gesture like an extra blanket, a smile or a gentler touch. "In addition, we present much-needed and ongoing community educational services. We feel that building lasting relationships and trust through outreach is our duty. When we are called into service, we want who we care for to already know that we are there to help them and be at their service. This is why we continue our pursuit of ambulance transportation and EMS excellence—a position of leadership that has become synonymous with the Brewster brand."